Today’s installment of digital painting 101 is all about layers. Layers are one of the features that most dramatically separate traditional from digital painting. Knowing how to use layers to your advantage can give you great freedom as a digital painter. In this lesson I’ll introduce the fundamentals of the layer palette, as well as my thoughts on layer economy. Layers exist to keep elements on your canvas separate from one another so they can be edited independently. How you use this power is up to you – whether it’s an individual layer for each character in your illustration, or a layer for each brush stroke. To make a new layer, click the new layer button on the bottom of the layer palette. The order in which the layers exist in your layers palette matters. You can think of it as a stack of transparent sheets of plastic – those on the top of the stack will block the contents directly underneath. To change this order, simply grab the title of the layer you want to move, and drag it it higher or lower in the stack. These can be thought of as a “bundle” of layers. A group is primarily an organizational tool. Like folders on your computer, they can be expanded or collapsed in the layer palette. Additionally, they can be moved and transformed as a group. To create a layer group, click the new group button on the layers palette. Once You’ve created it, drag other layers onto it’s title to add them to the group. You’ll know they’re a part of the group once they’re indented on the layer stack. Layer sets can be nested. So far the properties of layers have been pretty straightforward – but this gets a bit more complicated. The pulldown at the top of the layer stack describes the ‘blending mode’, which defaults to ‘Normal’. All of the other modes modify the way that the layer mixes with those below it in the stack. Most of the time I use two types of layers: Normal, and Multiply. “Normal” layers are used for opaque painting, as in thick acrylics, gauche, or thick oils. Layers add flexibility. They allow you to separate your elements from one another. The drawback, however, is that each added layer increases the file-size and amount of RAM used to manipulate the file. Additionally, a tall layer stack makes for a long scrollbar on the layers palette – leading to much wasted time in navigation. Each artist must find a comfortable balance between flexibility and reasonable file sizes. When working with written documents, do you ever find yourself saving every time you’re pleased with the state of the paper? You probably do this because it protects you against a potential future mistake. If you make a mistake it’s not a problem because you have the most recent save to fall back on. This general concept is at the heart of my layer strategy. In the long term I like to keep my layer stack short, but in the short term I make a new layer whenever I want to take a risk. This means that every time I want to add a large feature of some sort I make a new layer. If I mess it up in some way, it’s not a problem: I just delete the layer. If I like it, I flatten the layer down onto the rest of the stack. In this way I have the best of both worlds: short for easy computing, and plenty of new layers for confident painting. 3) Using a hard eraser I erase away what I don’t want. In this case, the paint that fell outside of the lines. 4) Once I’m satisfied with the result, I use the ‘Layer> Merge Down’ command (Ctrl+E) to flatten this into my layer stack. The example shows how my workflow allows for large, smooth transitions and simultaneously crisp edges. If I were painting on a single layer the entire time It would be very difficult to achieve this result. I don’t constantly add new layers – not for every stroke. If I’m noodling on small details I will keep it on one layer. Adding a new temp layer is only for large areas of color, or times where a clean edge is critical. You’ve covered a lot of territory in this lesson. I’ve attached a worksheet drill for you to practice these new techniques on. It will mainly focus on the ‘temp layers’ workflow. Your goal is to paint smooth gradations on under each of these organic shapes I’ve provided. You should work with Normal (opaque) layers. 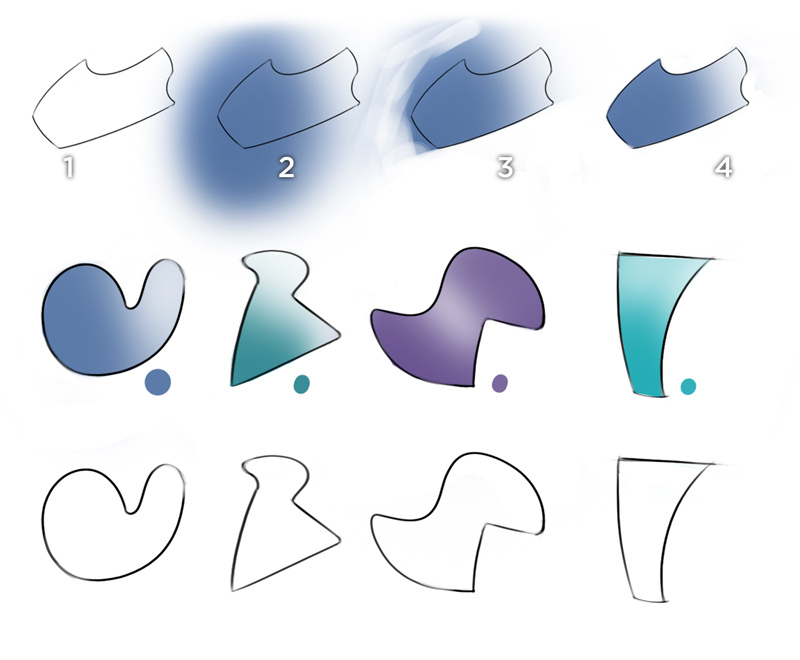 Also, remember to make a new ‘temp layer’ for each shape, and merge it down (Ctrl + E) when you’re satisfied. The end result will be a single painting layer above the background. Download the .PSD, and have fun!